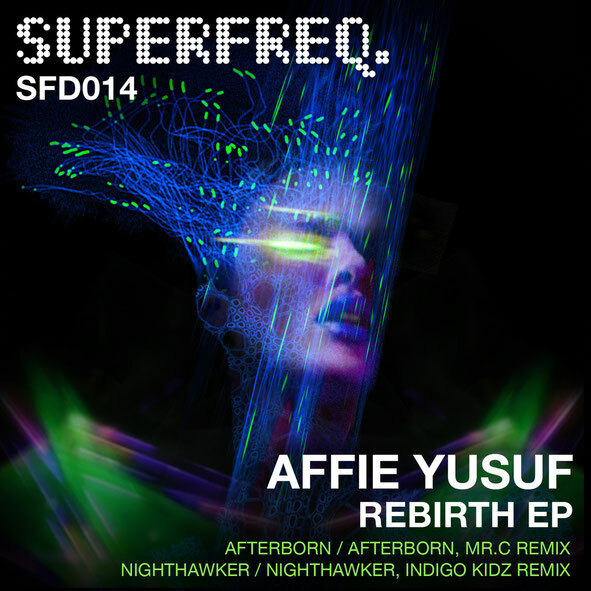 Affie Yusuf is next up on Superfreq with a pair of tracks that come complete with remixes from label boss Mr. C and Superfreq regulars Indigo Kidz. Affie has long been producing house and acid both solo and as part of House of 909 and Traffik with Trevor Loveys. Up first is ‘Afterborn’, a raw and mechanical house jam with rusty sounding hi hats, warehouse effects and a gripping melody pattern. There are subtle shades of the Windy City buried deep within the original and these provide some of the direction for Mr. C’s remix. His version is more elastic and rubbery, with spraying synths searching the track’s horizon and hiccupping melodies bringing a sense of late night funk. Next up, ‘Nighthawker’s drum hits sound unaffected and textured and lazy synths ride up and down in the background. It’s a nicely loose bit of work that should have people shaking their limbs just as freely. For the final cut, Affie and Mr. C join forces under their Indigo Kidz moniker and tweak things only subtly in their remix of ‘Nighthawker’, unthreading the drums so they wheel even more freely and marrying them to coarse, piled up claps. The EP is out today, check it below.